For those of you who aren’t obsessed with vintage fabrics and maybe even for those of you that are, I thought a little background on the fabric and how it came to be part of the Winter’s Moon range might be of interest. 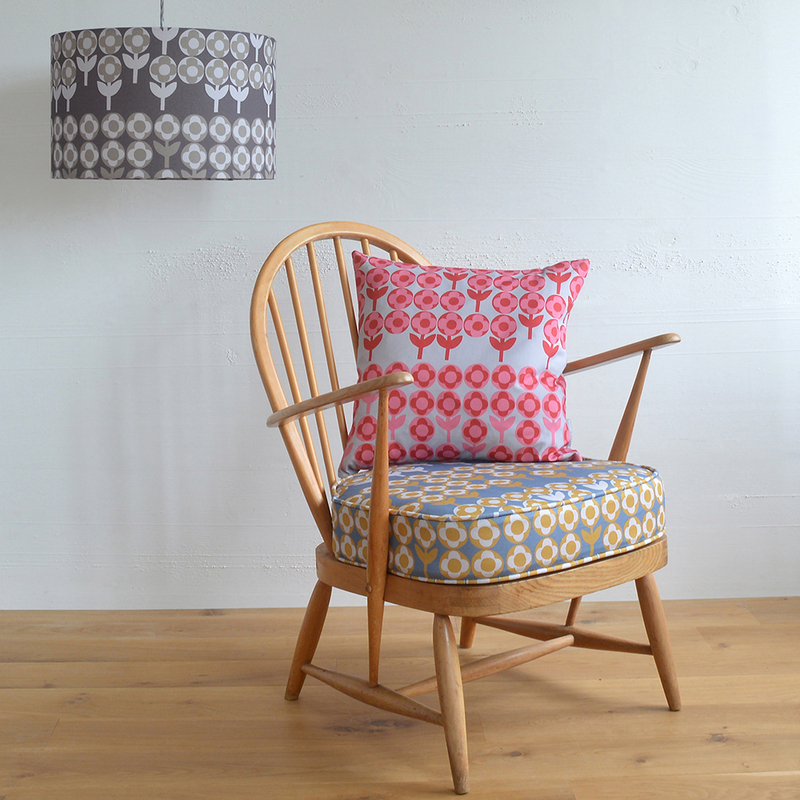 Verdure was designed in 1965 by Peter Hall for Heals, in a collection comprising five colourways, that I know of. It was hugely popular and according to Peter, it was Heals’ all time biggest selling design during the 1960's, they printed 10,000 metres of this design alone. The pattern was used in everything from clothes to accessories, also used widely in schools and hospitals for curtaining, and even used for light upholstery on chairs and cushions. The design is also held as part of the textile archive at the Victoria & Albert museum. That so many metres of it were produced is evident in the fact that there is still quite a lot of the vintage fabric around today. I had always loved the design I think due to its simplicity (which isn’t actually so simple when you study the layout) and scale – its works really well for cushions and lampshades. My idea to pursue it for Winter’s Moon basically started in January 2014 with one of those ‘I wonder?’ moments. I was sat in the studio looking through my pile of vintage fabrics and wished I could see what Verdure would look like in more contemporary colourways….I googled ‘Peter Hall textile designer’ and lo & behold I found him, living in New Zealand where he works as an artist. Sending an email was the next hurdle….umpteen re-writes and I forced myself to press ‘send’. I was very conscious how small a company Winter’s Moon is so did my best not to misrepresent or oversell myself but just said how much I loved the design and wanted to see it given another outing and to my delight Peter said yes to allowing me to produce it in new colourways. He had final sign off and made a few changes to the colours (always improvements) along the way and here we are. I know that Verdure is a favourite of many other vintage fabric lovers out there, so have felt a little anxious at working with a design that others have such affection for, but have done my utmost to treat it with the respect it deserves and hopefully to introduce it to a whole new audience.